SpaceX's Falcon 9 rocket and Dragon capsule roll out from the hangar for the CRS-2 launch to the International Space Station to deliver NASA cargo in March 2013. 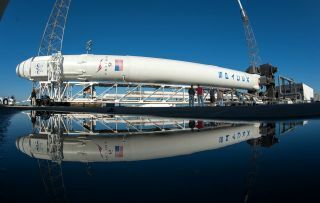 SpaceX is gearing up for a landmark liftoff that will not only inaugurate a new rocket upgrade and refurbished launch pad, but also provide a test of reusable rocket technology. The Hawthorne, Calif.-based private spaceflight company is scheduled to launch an improved version of its Falcon 9 rocket from a newly rebuilt pad at California's Vandenberg Air Force Base on Saturday (Sept. 14). "This is essentially a development flight for the rocket," Musk told SpaceNews. "It's not an operational flight." The Falcon 9 v1.1 is considerably longer and more powerful than the baseline Falcon 9, which has flown five times. All of those previous launches — two test flights and three missions to the International Space Station with SpaceX's Dragon cargo capsule — took off from Cape Canaveral Air Force Station in Florida. Musk and SpaceX aim to reduce the cost of spaceflight dramatically by developing rapidly reusable rockets. Indeed, the company is working on a reusable prototype called Grasshopper, which has made a series of increasingly more complex test flights over the past year. In line with these ambitions, the upcoming launch from Vandenberg will also feature a reusability demonstration. SpaceX plans to re-ignite the Falcon 9's first-stage engine in an attempt to make a soft water landing of the booster in the Pacific Ocean. Like many other bold first tries, this one probably won't work, SpaceX officials say. "We do not expect this to be successful the first time," SpaceX spokeswoman Christina Ra told SPACE.com via email. "We've never done any water landing tests, so the chance of success is really low." The Grasshopper prototype already uses the 1D, and the engine will also be incorporated into SpaceX's Falcon Heavy booster, a huge rocket still in development that will use 27 engines in its first stage. The Falcon Heavy, which is scheduled to fly for the first time in 2014, will be capable of carrying payloads weighing 53 metric tons to low-Earth orbit, company officials have said.